What’s the Best Type of Seat or Back Cushion for Your Bar Stools? With such a wide selection of seat types, how do you know which cushion is best? Here are a few tips that will help you decide what’s right for your next set of stools. We recommend this type of cushion for everyday use. 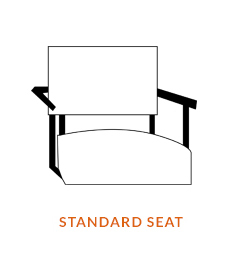 It’s a seamless, rounded seat cushion that most people say is the more comfortable choice. The gentle supporting rise of this cushion will keep you comfy for as long as you choose to sit. This cushion comes standard on many brands, and you’ll also find it under “seat style” on Callee stools. Most Trica brand stools come with the standard cushion, which can be upgraded to the even plusher Comfort Seat. This is a cushion with squared edges and vertical seams for a more formal look. The box cushion is often accented with furniture pins and is common on leather and faux leather seats. 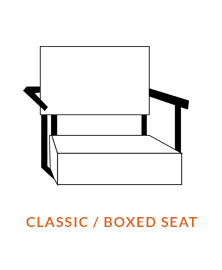 The box cushion can be just as comfortable as the standard cushion, but you’ll need to be more aware of your posture. If you like to lean or sink into your chair, you might find it a bit less comfortable. This cushion is available under “seat style” on Callee stools, and comes standard on many other brands’ designs. Stools with a cushioned back are the most comfortable choice for long spans of use. You can easily sit in one of these stools at your home bar and watch an entire sports game. They’re also great if you work while seated. You can see examples of cushioned back stools here in button-tufted style or with oval backs. 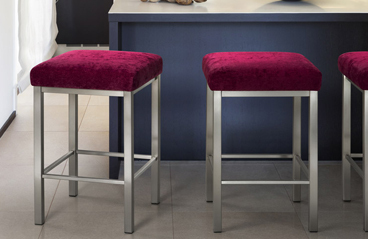 Cushioned arms add another layer of comfort to stools with a cushioned back. These are best for relaxing because they support your entire upper body. They also make it easy to hold your drink of choice. Stools with arms are less ideal for working, though, if you need a wide range of motion for your arms and hands. Many wooden and polymer stools lack a seat cushion. While less comfortable for long periods of time, there are advantages to stools without cushions. They’re great for creating a streamlined look in a room. If you sit for shorter periods—say, a quick breakfast in the morning at your kitchen island—a cushionless stool is perfectly fine. They’re also often cooler in hot climates or outdoors. These stools are also great for commercial settings like bars or cafes, because they’re easier to clean (just wipe them down) and they encourage a faster turnover of customers. If you have any questions about which type of seat cushion is best for your lifestyle, home or business, just send us a note and ask away! We love helping you find the best stool that matches your style and your day-to-day routine.